Available from iOS and Android App Stores. Heedful introduces the concept of crowd security. Join and share the movement. 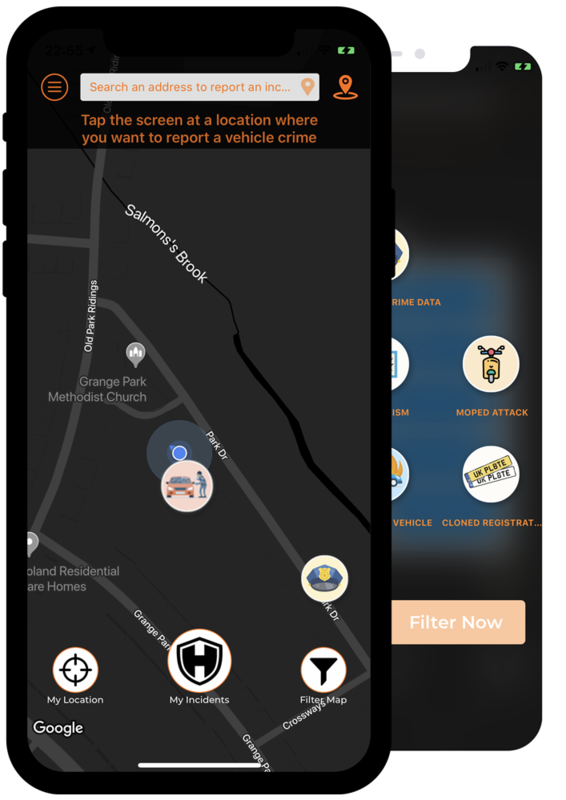 Heedful uses real time community data as a PREVENTATIVE measure against vehicle crime; allowing you to know what’s been going on in an area, before you park there. Tag us @heedfulapp with #weareheedful and retweet theft reports. Spot the Heedful Bike on rideouts to win cool stuff and show us your rides. Help us grow, as more members means more peace of mind – share now. The following key points of the Terms are highlighted here for your convenience only. These key points are not made in lieu of the full Terms and their presence in this section does not mean that they are intended to supersede or override any other terms or conditions provided by Heedful. Safety against Crime : Heedful is not a security service. Heedful does not guarantee protection from crime.Heedful provides real time data, taken from publicly available law enforcement, parking structure and community uploaded data for indicative purposes only, and in no way represents advice or directions on where you should park. The service is to be used by you to make your owndecisions on where to leave your vehicle. The aim of Heedful is to create a community of vigilant user who help one another. Cautious driving : Always drive vigilantly according to road conditions and in accordance with traffic laws. DO NOT use Heedful while you are driving. Any updates you make or view on Heedful, should be done so in accordance with applicable road traffic laws in your jurisdiction and must not distract the driver’s attention to the road. Non-continuous updates : The information provided by the Service originates from other users of the Service. Such information is intrinsically fluctuant and may be inaccurate, incomplete or outdated. Heedful does not provide any warranties to such information’s credibility or reliability. Cost of the Service : The Internet connection required to use the Service, and any associated charges (e.g. mobile data expenses) incurred by your use of the Service are your exclusive responsibility and made solely at your expense. Transmitting and receiving real-time updates to and from the Service, requires an online (e.g. Wi-Fi, 3G, 4G) connection between your cellular device and the Internet. The expenses of such connection are as prescribed by the agreement between you and your communication service provider (such as your cellular company), and according to its applicable terms of payment. The Service allows users to view or upload vehicle crime incidents that have happened to them. It allows users to assemble and update the map to reflect such occurrences. The Service is provided mainly through the Software. Heedful hereby grants you a free of charge, non-exclusive, time-limited, non-transferable, non-sub-licensable, revocable license to use the Service (including the Software) for non-commercial purposes, subject to these Terms. You may use the Service solely for private and personal purposes. You may not use the Service commercially. For example, you may not: (i) offer to third parties a service of your own that uses the Service; (ii) resell the Service; (iii) offer to rent or lease the Service; or (iv) offer the Service to the public via communication or integrate it within a service of your own, without the prior written consent of Heedful Ltd. For clarity, the examples listed are made for illustrative purposes only; they do not constitute an exhaustive list of restricted activities involving the Service. When using the Service or the Site you may not engage in scraping, data mining, harvesting, screen scraping, data aggregating, and indexing. You agree that you will not use any robot, spider, scraper or other automated means to access the Site or the Service’s database for any purpose. There are certain types of conduct that are strictly prohibited on the Service. Please read the following restrictions carefully. Your failure to comply with the provisions set forth below may result (at Heedful’s sole discretion) in the termination of your access to the Service and may also expose you to civil and/or criminal liability. (i)	You will not abuse the information provided to you, by Heedful or the community. (ii) You will not attempt to defraud Heedful, or its users by uploading false or misleading, telephone, account, personal, vehicle or profile data. (iii) You will not report false crime incident reports. (iv) You will not use Heedful as a means to force or coerce anyone to park anywhere against their will. (v)	You will not use Heedful, the data or content within it, or the crime reports uploaded by its members, to pursue any unlawful action against known or suspected criminals, as an individual, group or vigilante. Heedful retains the right to block your access to the Service and discontinue your use of the Service, at any time and for any reason Heedful Ltd deems appropriate, at its sole and absolute discretion. The Service allows all users of the Software to submit and post information and content to other users (“Content”). You assume sole responsibility for any Content you post and you alone are liable for the consequences when you post Content. All intellectual property rights in and to the Site, the Service and its database, including copyrights, trademarks, industrial designs, patents and trade secrets – are either the exclusive property of Heedful or its affiliates or are exclusively licensed to Heedful. The Service is protected, among others, by English Law. “Heedful”, the Heedful logo, and other trade and/or service marks are the property of Heedful or its affiliates and you may not use such logos or marks for any purpose that is not expressly authorized in these Terms without the prior written consent of Heedful. Apple, Inc. bears no duties or obligations to you under the Terms, including, but not limited to, any obligation to furnish you with Service maintenance and support; You will have no claims, and you waive any and all rights and causes of action against Apple with respect to the Service or the Terms, including, but not limited to claims related to maintenance and support, intellectual property infringement, liability, consumer protection, or regulatory or legal conformance; Apple and Apple’s subsidiaries are third party beneficiaries of the Terms. Upon your acceptance of the Terms, Apple will have the right (and will be deemed to have accepted the right) to enforce these Terms against you as a third party beneficiary thereof. You represent and warrant that: (i) you are not located in a country that is subject to a U.S. or U.K. Government embargo, or that has been designated by the U.S. or U.K Government as a “terrorist supporting” country; and (ii) you are not listed on any Government list of prohibited or restricted parties. HEEDFUL PROVIDES THE SERVICE AND CONTENT INCLUDED THEREIN FOR USE ON AN “AS IS” AND “AS AVAILABLE” BASIS. THEY CANNOT BE CUSTOMIZED TO FULFILL THE NEEDS OF EACH AND EVERY USER. WE HEREBY DISCLAIM ALL WARRANTIES AND REPRESENTATIONS, EITHER EXPRESS OR IMPLIED, WITH RESPECT TO THE SERVICE, INCLUDING, WITHOUT LIMITATION, ANY WARRANTIES OF MERCHANTABILITY, AND FITNESS FOR A PARTICULAR PURPOSE, FEATURES, QUALITY, NON-INFRINGEMENT, TITLE, COMPATIBILITY, PERFORMANCE, SECURITY OR ACCURACY. Additionally, and without derogating from the above clause, Heedful disclaims any warranties relating to the accuracy of the maps, Content, or crime reports displayed by the Service. For instance, if you park in an an area with no crime reports, Heedful is not liable for any loss or damage to your property if a crime should occur. You agree and acknowledge that you assume full, exclusive and sole responsibility for the use of and reliance on the Service, and you further agree and acknowledge that your use of or reliance on the Service is made entirely at your own risk. Heedful exerts efforts to provide you with a high quality and satisfactory service. However, we do not warrant that the Service will operate in an uninterrupted or error-free manner, or that it will always be available or free from all harmful components, or that it is safe, secured from unauthorized access to Heedful’s computers, immune from damages, free of malfunctions, bugs or failures, including, but not limited to hardware failures, Software failures and Software communication failures, originating either in Heedful or any of its providers. HEEDFUL, INCLUDING ITS OFFICERS, DIRECTORS, SHAREHOLDERS, EMPLOYEES, SUB-CONTRACTORS AND AGENTS WILL NOT BE LIABLE FOR ANY DIRECT, INDIRECT, INCIDENTAL OR CONSEQUENTIAL DAMAGE, OR ANY OTHER DAMAGE, AND LOSS (INCLUDING LOSS OF PROFIT AND LOSS OF DATA), COSTS, EXPENSES AND PAYMENTS, EITHER IN TORT, CONTRACTUAL, OR IN ANY OTHER FORM OF LIABILITY, ARISING FROM, OR IN CONNECTION WITH THE USE OF, OR THE INABILITY TO USE THE SERVICE, OR FROM ANY FAILURE, ERROR, OR BREAKDOWN IN THE FUNCTION OF THE SERVICE, OR FROM ANY FAULT, OR ERROR MADE BY OUR STAFF OR ANYONE ACTING ON ITS BEHALF, OR FROM YOUR RELIANCE ON THE CONTENT OF THE SERVICE, INCLUDING, WITHOUT LIMITATION, CONTENT ORIGINATING FROM THIRD PARTIES, OR FROM ANY COMMUNICATION WITH THE SERVICE, OR WITH OTHER USERS ON OR THROUGH THE SERVICE, OR FROM ANY DENIAL OR CANCELLATION OF YOUR USER ACCOUNT, OR FROM RETENTION, DELETION, DISCLOSURE AND ANY OTHER USE OR LOSS OF YOUR CONTENT ON THE SERVICE. IN ANY EVENT, YOUR SOLE REMEDY WILL BE LIMITED TO CORRECTING SUCH ERRORS, OR MALFUNCTIONS, AND IN LIGHT OF THE RELEVANT CIRCUMSTANCES. Without derogating from any applicable law, you agree to indemnify and hold harmless Heedful and its employees, officers, directors and agents, as well as all third party from and against all claims, damages, expenses, losses and liabilities that arise as a result of your violation of these Terms. In view of the fact that the Service is provided to you free-of-charge, this indemnity is intended to cover all expenses, payments, loss, loss of profits or any other damage, direct or indirect, monetary or non-monetary, incurred by Heedful, its employees, officers, directors or agents as a result of your violation of the Terms, including but not limited to legal expenses and attorney fees. Heedful may, either partially or in its entirety and without being obligated to provide prior notice – modify, adapt or change the Software, the Service’s features, the user interface and design, the extent and availability of the contents in the Service and any other aspect related to the Service. You will have no claim, complaint or demand against Heedful for applying such changes or for failures incidental to such changes. Heedful may, at any time, terminate the provision of the Service in its entirety or any part thereof, temporarily or permanently, at its sole discretion. Heedful may modify these Terms from time to time. If fundamental changes are introduced, a notice will be posted in the updated version of the Software as well as on the Service’s home page on the Site. Your continued use of the Service after the Terms have been modified signifies your assent to the updated Terms. If you dissent to the updated Terms or to any term within them, you must discontinue all further use of the Software. Heedful is committed to maintaining the trust and confidence of: visitors to our web site, registrants of our app and subscribers to our email list. Here you’ll find information on how we treat data that we collect from you. When someone visits www.heedfulapp.com we use a third party service, Google Analytics, to collect standard internet log information and details of visitor behaviour patterns. We do this to find out things such as the number of visitors to the various parts of the site. This information is only processed in a way which does not identify anyone. We do not make, and do not allow Google to make, any attempt to find out the identities of those visiting our website. You can find more information on how cookies are used on this website in the Cookies Policy below. • Your name: because we’re polite and you’re not a robot. • Your mobile phone number: so we can securely register your device, and you are who you say you are. • Your email: so we can send you your password and you can login – that’s pretty important. 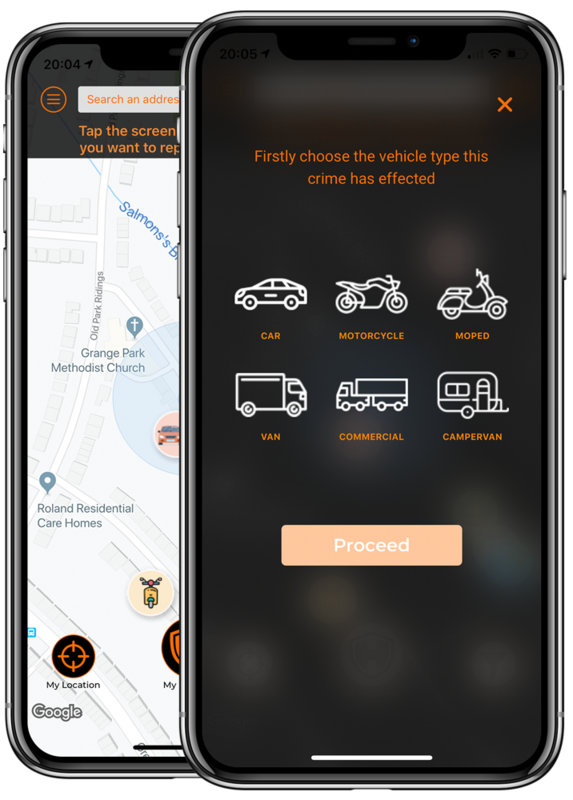 • Your vehicle details, such as make and registration: so users of the app can identify your vehicle and mark it safe or in danger, the crux of how our app works. This info is never publicly shared with anyone else. • to tell you about things that we think you’ll like, only if they relate to why you signed up. This may be special offers from us or our partners; this will only be things directly related to motorcycles and the industry – we want you to like our emails. You are entitled to access the personal information that we hold. Email us at info@heedfulapp.com and we will address your enquiry as soon as we can. We keep our privacy notice under regular review. This privacy notice was last updated on 1st June 2018.